Can anybody provide any insight into how the progression of deposits in the Illerup find illustrates the evolution of weapons, armor, and possibly tactics of the armies fighting in the region? Who was fighting who, and why? Just plunder, or was this also "politics?" As Sean mentioned, Ilkjær does have some reports in english, so we can read some of it. http://www.illerup.dk/documents/illerup_75.pdf. What about the economic development related to the manufacture and trade of these items? Again, Ilkjær suggests that similarities of items to those from many geographic regions suggests significant trade/travel. But was it contermporary? Were the people of this rigion, in this time, trading with Syria? Arne, you mention that armor is missing because the germanic tribes didn't wear it, as a rule, until the migration era. I assume that the lack of armor means that either they didn't defeat an invasion of people who did wear it (at least not here, or they only sacrificed the arms/armor of their own fallen?). According to Ilkjær (http://www.illerup.dk/documents/illerup_84.pdf) these were from the defeated armies, so that suggests to me that these battles didn't include Romans, at least (although Roman coins were found). It also suggests to me, as Elling already pointed out, that any armor was taken and not included in the bog sacrifice. 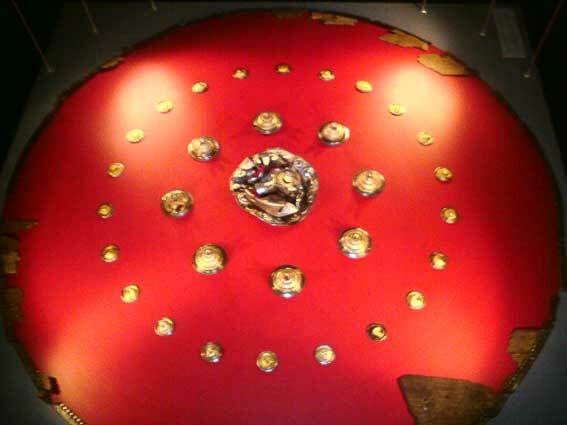 I think it unlikely that NO invaders wore armor, given the size of the find and the diversity of artifacts within it (which suggests significant trade with people who did have armor). That leads me to think that either the rare piece of armor was either kept, or that it completely deteriorated. Or perhaps I'm wrong, and there is some other reason that actually prevented the invaders from wearing armor. Also, Ilkjær concludes that these invaders were from Norway and Sweden. Do those of you who can read his untranslated work concur? It seems likely, but still a little tenuous. On the other hand, I have only had a chance to read a few short papers in english. It seems to me that we haven't even scratched the surface of this find, yet! Although the translation offers are both generous and helpful, I don't really know enough about the language to even ask what to translate, or even to know for certain what the right questions would be. [Can anybody provide any insight into how the progression of deposits in the Illerup find illustrates the evolution of weapons, armor, and possibly tactics of the armies fighting in the region?. The evolution of weapons can be seen if you compare the weapons from all the bigger bog deposits which each other. With the end of the marcomannic war (166-180 A.D.) the weapons change into forms more suitable for opposing roman legionaries. 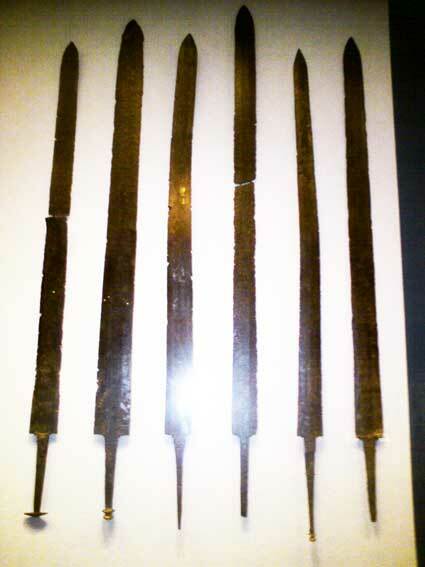 For example: Bows are more common after the war and there are finds of arrow heads made to pierce roman chainmail. Who was fighting who, and why? The archaeological community would also like to know the details. It also suggests to me, as Elling already pointed out, that any armor was taken and not included in the bog sacrifice. 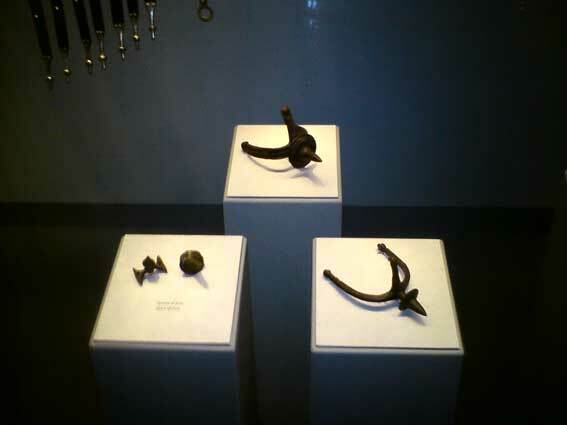 Small Parts of armour (worn by early Germans, but with roman origin) were found in the bog sacrifice of Thorsberg. So it seems that armour was sacrificed but seldom worn. Of course nobody can be sure how much of the loot from the battlefield was really sacrificed. Also, Ilkjær concludes that these invaders were from Norway and Sweden. The main hints for the origin of the warriors is the form of their fire strikers, which were more common in scandinavia and very different from the continental form. Combs from the sacrifices are another hint. They weremade out of elk antlers, a material not used on the continent an apparently not traded. It seems to me that we haven't even scratched the surface of this find, yet! Don't worry, even archaeologists have just scrathced the surface of this topic. The bog deposits of that era helped to answer many questions about these armies, but they also started even more. There is a great catalogue available about a recent exibition in Kopenhagen. There should be an english version of it, but i am not sure. So, i can just give you the german title, sorry. "Sieg und Triumpf - Der Norden im Schatten des römischen Reiches (Kopenhagen 2003)." It is a very good read, including articles who provide an interesting perspective on the finds. A total of 435 pages with a rather good photographic catalogue of exhibited object. The articles deal with the nature of the excavations and what archaology has concluded over the years. It also deals with military organization and warfare in iron age scandinavia and what effect the roman Empire had on the peoples outside its boundaries. Anyone interested in the period should get a copy of the catalogue! Do you know any place where they sell it? I couldn't find any copies through the normal search routes. Peter, Thanks much! I'm going to try to locate this. I think this is a fascinating topic. Arne, thanks for the insights. I'm particularly interested in your observations comparing different bog deposits, and how the dates associated with those illustrate the evolution of the bow as a counter development to Romans mail. It is also neat how it seems to be the common, everyday items like firestrikers and combs that prove most useful determining where people were really from. Thank you to all who have added to this to make it more than simply a link elsewhere. There has been just enough added value here that making it a Spotlight seemed appropriate. It also happened to receive more Spotlight Nominations than I've seen on any other topic before. [Arne, thanks for the insights. I'm particularly interested in your observations comparing different bog deposits, and how the dates associated with those illustrate the evolution of the bow as a counter development to Romans mail. To put it very simply: Before the marcomannic war there were almost none. Only a few you might refer to as "hunting weapons". After the marcomannic war there is a sudden increase in the amount of bows, and armour-piercing arrows appear for the first time. It is also neat how it seems to be the common, everyday items like firestrikers and combs that prove most useful determining where people were really from. That is almost a kind of rule in archaeology. It also happened to receive more Spotlight Nominations than I've seen on any other topic before. Guess, we really can call them "the honored dead" then. I got my copy at the museum. Perhaps it is out of print? That would be too bad! WOW! Very interesting, I'd love to be in on that dig, what an experience... Thanks for sharing. I don't know. The berserk style of fighting seems to have been fairly popular in Germanic culture. Or so Ancient Germanic Warriors by Michael Speidel would have me believe. Individuals, at least, did apparently reject armor for the psychological effect. Thanks, i didn't know there was a new dig going on. Can't wait for more details. Nor did I Arn, it was rude of me not to mention that this was brought to my attention my fellow Ulfhednar member Steve Pollington. I too look forward to reading the reports, incidently and off topic there was a recent discovery during highway works in the south of England of skeletal remains showing severe trauma, believed to be up to 80 individual males aged between the late teens and twenty five, and provisionally dated to the late 8th/early 9th century. This summer I had the pleasure of making another visit to Moesgård Museum, and the Illerup exebitiob. Is there a catalog out yet for the initial weapons find? The full catalogue of the Illerup find span 12 fantastic bands. The last two deal with swords. Ilkjaer makes a comparative analysis with spathae finds all over europe and outline a typology that is very detailed. It is safe to say the impression one might have had of the roman spatha is probably less stereotype after reading through this book. I for one was overwhelmed by the variety. Details on hilts and baldrics can be found in earlier bands. The catalogues are published by Jutland Archaeolgical Society Publications. Here is a link to the illerup site, where info on the books can be found. In Danish and German only. My response was too slow. Question: Would it be correct to term these people Scandinavian, for any reason other than the finds were in Denmark? Were they culturally a Scandinavian people? 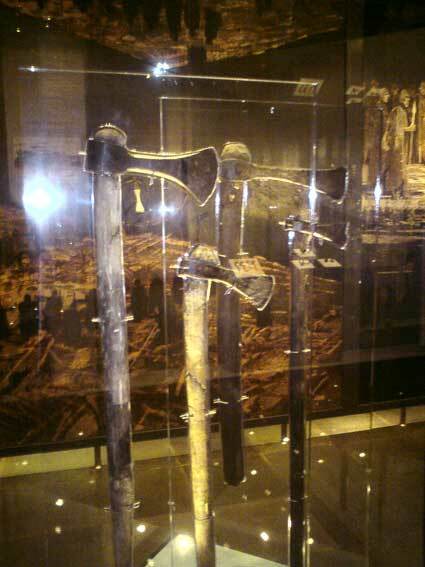 Those people who carried the weapons from Illerup A, came from Scandinavia. The main indicator for this are the fire strikers from this find place. The majority of it are of scandinavian form and only a small minority of continental form. So far for their origin. Cuturally spoken they were from a germanic tribe at "war" with their southern neighbours, who also were of germanic origin.